Walk up to the parking lot of H&B pawn shop on Northeast Martin Luther King Jr. Boulevard just before 1 pm on a Sunday, and it looks like a church social without the church. The red awning of Kee's #Loaded food cart won't even crack open for another 15 minutes, but already there's a line 30 deep: couples, moms with kids, women in their Sunday best and construction guys in work shirts. Every time a car wants to park, the line has to get out of the way. 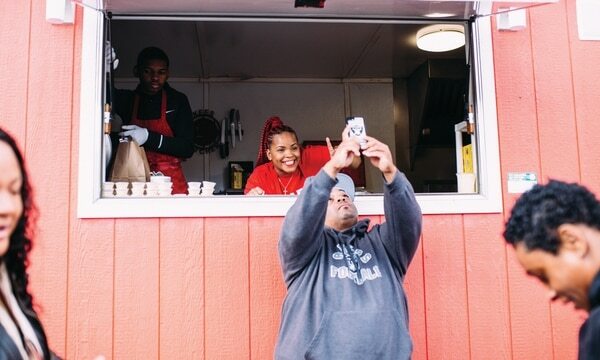 They're all in line for the same thing: the biggest, baddest soul food plates in Portland, so stacked with wings and hot links and mac salad and saucy smoked ribs you can't even close the container without a collard green slipping out. "Heads up!" says a voice in the back. Turns out another car's coming through. 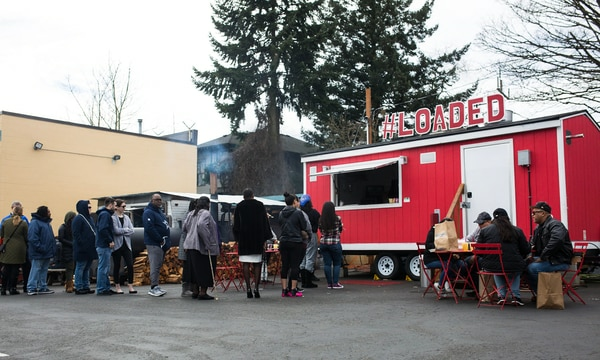 Every Thursday through Sunday, chef Kiauna Nelson serves whopping 4-pound homestyle plates of food to the neighborhood she grew up in, back when "Williams" was Albina. 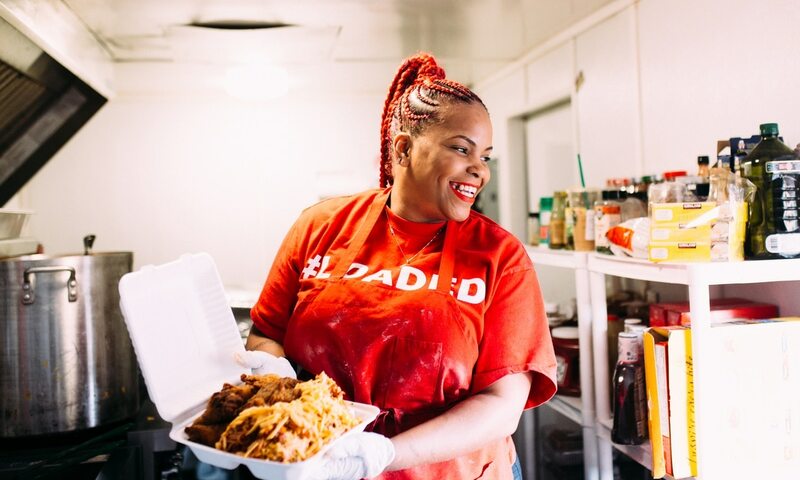 People stand in line for an hour to get her food, and she sells out every single day she's open—almost always within a couple hours. Nelson says she gets marriage proposals from people in love with her loaded baked potatoes, and her most loyal patrons sometimes tip her in weed. In one of the most hyped and cheffy food scenes in America, Nelson's cart is a phenomenon all its own. 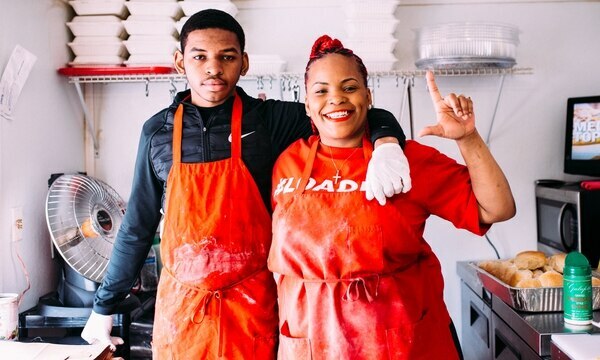 And we're proud to name Kee's #Loaded Kitchen our 2018 Cart of the Year. In part, that's because she's at the forefront of the most exciting thing to happen in food this year: Portland is finally getting its soul back. 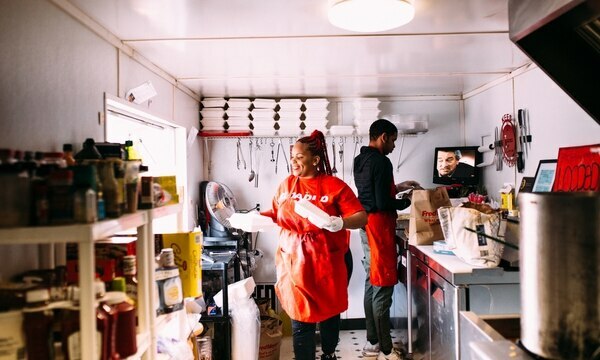 Los Angeles-founded, Kimye-approved soul pop-up Trap Kitchen—whose owners, Spank and News, catered food to Jay-Z's tour bus when he was in Portland last year—set up its first permanent location in Montavilla this January. 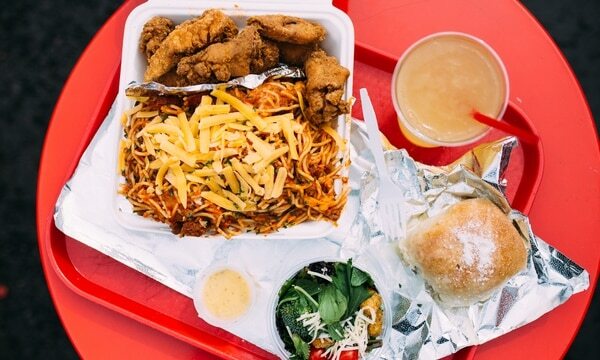 Last December, old-school Portland chicken-and-waffle maker William "Dub" Travis III finally got his own standalone restaurant again, Dub's St. Johns, after losing his original Mack and Dub's restaurant to fire in 2012. But still, there's nothing quite like Kee's. Nobody who stands in line for her food even knows what's going to be on the menu until two hours before she opens, when she posts the menu on Instagram. Everybody gets the same thing: a nearly 4-pound plate of food with dessert and a drink. Your only decision to make is how many plates you want. Each plate costs $18 to $22, and it's at least two meals—maybe even three, though Nelson says not everyone wants to share. "I always loved to eat," says Nelson, 38. 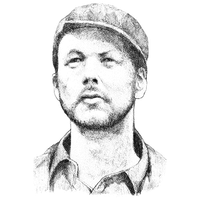 "I learned in business school you need to sell something people can't just go out and get. What I wanted was a big plate that came with drink and dessert. I didn't want to buy all of them separate. You get the homemade desserts, the lemonade with a big giant plate. You eat some, take a nap, come back. I don't like when all the food is gone in one setting. I want to come back to it." She built her entire business by herself on Instagram and Facebook, with little attention from any mainstream press. "This business is highly based online," Nelson says. "You don't even know the menu unless you're online. Trust and believe—they're on their phone checking the menu at church. That's the main reason I open at 1 o' clock on Sunday: People were getting out of church and the food was gone. That broke my heart. I know how hungry people get at church." Consider it a homestyle take on prix-fixe. One day, Kee's might serve mac and cheese loaded to the gills with bacon and Dungeness crab, and the next it's smoked meatballs and spaghetti. It's less like a restaurant than being invited to someone's house every day for dinner. "The food that I eat here is the food I make for my family every day," Nelson says. "There's no way I'm gonna have the same thing every time. I was like, 'I'm just gonna cook what I feel like.' There's a lot of fancy food out there. A lot of chefs do fancy food that came out of culinary school. That's not what I want. People want to eat food they grew up on." A lot of people are picking up what she's throwing down, and not just in Portland. Nelson says people visit from all over the country to finally eat the 16-hour smoked brisket they've been watching her make on Instagram, where she's got nearly 28,000 followers—more than Le Pigeon and more than Tusk. Though her cart's open only four days a week, she works seven. When the cart is closed, she's busy catering her food to Nabisco, Tripwire security or even dropping off saucy wings for workers at famously fitness-conscious Nike. "I delivered some food for Nike this morning at 8 am," she says, laughing. "They gave me a big old fat blunt!" But Nelson had to come a long way to get where she is now. "I've been to prison. I was gangbanging. At that time, parents were drug addicts, crack had hit the scene," says Nelson about her childhood growing up along MLK. "It was like an '80s movie. We was running up to cars, we were getting shot at every day. A lot of my friends were murdered. I don't have tears left. I was in funerals my whole childhood." After 12 years of selling on the streets, she finally got caught—taking prison time rather than say who she'd gotten the drugs from. "I thought I'd get probation," she says now. "They were like, 'No, you're going to prison.'" She served six months of a one-year sentence while pregnant with her third child—in jail, "pregnant girls get double food," she says—and when she got out in 2011, she enrolled herself straight into business school at Portland Community College. For three years, she didn't miss a class. She wanted to get out of dealing drugs, out of Section 8 housing and off food stamps. Her way out was the gift she knew she had: Nelson could cook better than anyone she knew. "I got a new cookbook every time I went to the grocery store," she says. "I was reading cookbooks—I still have every single last one of them." Her recipes are all self-taught, including that crazy-loaded baked potato she's made into her signature: smoked chicken, tender smoked brisket, jumbo prawns, Tillamook cheddar and organic broccoli, all loaded onto a giant, buttery baked potato. It's homestyle food with the volume turned way up. Before she got the cart together in February 2016 and plopped it down next to our 2016 Cart of the Year, Matt's BBQ, she sold spaghetti out of her house. But way too many people showed up. "I didn't sell food longer than two months from home. There were too many people outside eating," she says. Her cart was busy from day one, but in the summer of 2017 she doubled down: In June, she bought a new cart twice the size, and in August, she doubled the number of days she was open. Now, instead of living in Section 8 housing, she's catering for the Oregon Housing Authority. The whole family helps make it happen: Her oldest son handles the register, and her nephew bags the food. She'll have to move the cart within the month—her landlord wants to rent the space to George Morlan Plumbing. But even though she got an offer of free rent if she moves her cart to St. Johns, she wants to stay in the neighborhoods where she grew up, near the traditionally black churches and the community she knows. She'll be in her current spot through March 25, and then, at the beginning of April, she'll move just 10 blocks south to the cart pod at Northeast Beech Street and MLK. "I want to be right here. It's important to me," she says. "Everybody's being gentrified out. It means a lot to me and the people that are here. It gives them a chance to come back to this side of town and talk to the people they know who've been here 30 years." GO: Kee's #Loaded Kitchen, 4709 NE Martin Luther King Jr. Blvd., 503-516-2078, facebook.com/KeesLoadedKitchen. Open noon Thursday-Saturday, 1 pm Sunday till the food runs out. Instagram: @keesloadedkitchen. After service Sunday, March 25, Kee's will move to the Beech Street pod at 3625 NE MLK Jr. Blvd.